This juicy salad will help you fall back in love with the beautiful Iceberg lettuce. 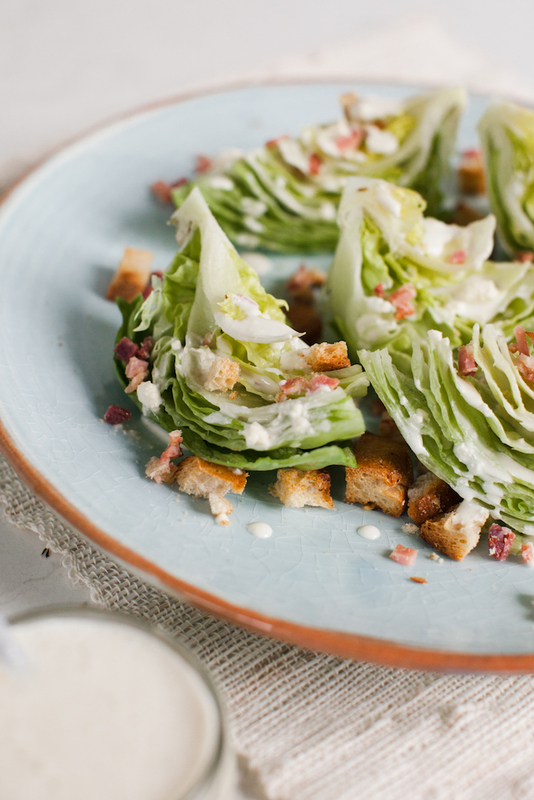 A creamy blue cheese dressing (which also makes a delicious dip with crudité) is classically paired with bacon and a few croutons for crunch. Place the blue cheese, sour cream and buttermilk along with the lemon juice in a blender and blend. Taste and season with salt and pepper. Store in an air tight jar in the refrigerator for up to a week. Remove the large floppy outer layers of the berg. With a sharp knife chop it in half and, depending on the size of the lettuce, chop each half into either quarters or thirds, leaving you with 6‒8 triangle wedges. Place these on a platter and just before serving sprinkle with the bacon and croutons, then drizzle with blue cheese dressing.